A fantastic addition to the Battle MiLK series, this third installment features four new artists contributing their work to the wide range of captivating images from the team. Upcoming projects from the artists include Star Wars 1313, Thor 2, Fountain City, and Star Wars: The Clone Wars, season 5. Born and raised in Dublin, Ireland, Kilian Plunkett moved to the US in the early nineties when the chance to work as a professional comic artist came along. Comics taught him the value of learning to draw as broad a range of subjects and settings as he could. He worked as a Comic Artist for Dark Horse, DC, and Marvel until 2005, when the opportunity to join Lucasfilms new animation division arose. He has been Lead Designer on Star Wars: The Clone Wars since 2007. Jackson Sze studied Illustration at Art Center College of Design with an emphasis in Entertainment Arts. Since leaving school, he has worked in advertising, video games, television, and film. He is currently Senior Concept Illustrator at Marvel Studios and working on superhero movies. Thang Le was born and raised in Southern California. He studied at the Art Center College of Design, majoring in Transportation Design. He started his career in entertainment working on television commercials and video games. This eventually led to working in animation, film, and theme parks. Currently he is working at Industrial Light & Magic as a Concept Artist. His credits include The Avengers, Battleship, Tron Uprising, Star Wars: The Clone Wars, and Green Lantern: The Animated Series, and he as also worked for Disney Imagineering. Le Tang grew up in Southern California but spent a few years as a Story Artist at Lucasfilm Animation. Since his return to Los Angeles, he has told some kung fu fighting tales at Nickelodeon. Currently he is doing his storytelling at Dreamworks Animation. David Le Merrer was born in Paris where he grew up and later studied graphic design at ESAG Penninghen. After getting his degree, he spent a few years in the UK creating art for video games. He grew tired of the rain and in 2005 the road took him to California where he ended up at another video game company. Now he is working on Star Wars: The Clone Wars at Lucasfilm where he met all these crazy folks and decided to join the Battle MiLK team. While taking a shortcut through the architecture department at Kansas State University, Pat Presleys life took a severe turn. One day late in 2007, a friend suggested that Pat should join him at Lucasfilm. After years of toiling away in the dark basement of design school and professional architecture projects, he decided to come up for air and try his hand at Concept Design. Since then he has been with Star Wars: The Clone Wars crew, still improvising, learning, and hoping they havent found out where he sits. Born and raised in smoggy Southern California, Justin Ridge received his BFA from California State University, Fullerton, and has storyboarded and directed several animated shows such as Avatar: The Last Airbender, Star Wars: The Clone Wars, and The Cleveland Show. Matt Gaser was born and raised in Northern California. At an early age he ran around the woods pretending to be an Ewok while drawing his own characters, writing stories, and fueling his imagination. He studied Illustration at Art Center College of Design, interned at Klasky Csupo as a Background/Prop Designer for Rugrats before completing his studies. After graduation, he worked in video games for six years, which eventually led to an amazing opportunity working at Lucasfilm on Star Wars: The Clone Wars. After several years at Lucasfilm, he decided to shift gears and freelance full-time out of his studio in San Francisco. Some recent projects he has been designing for include Green Lantern: The Animated Series and the feature film HOP. He is currently working for Andrew Adamson on his new feature in development, Fountain City. I got this for my boyfriend, and he really really liked it. It has good walk-throughs of each piece and that sets it apart from other art books with gorgeous illustrations. There is also a handsome variety of styles and subjects. A good buy! I own the previous 2 battle milks and had to have this one, too. This book was a pretty big let down. I am a huge fan of the art that comes out of the visual development stage of projects. I love the raw feeling and seeing the iterations of ideas. I love seeing the process behind great storytelling art. You are not going to find that kind of thing in this book. What you will find instead is a collection of stories with a rough presentation and ending with a quick demo of a picture. 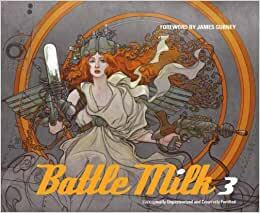 I have not seen the last two books in the Battle Milk series, so all I can speak for is Battle Milk 3. The book tries to wear too many hats, as if it can't decide what it wants to be. Is it a book of unfinished comics? Is it a book of demos? 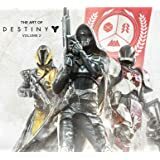 Is it a book of concept art? In the end, I feel this lack of direction ultimately killed it for me. 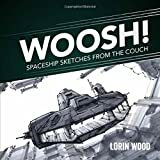 I was expecting a book that showcased sketches and development behind an artist's personal project. Due to the way much of the material was presented however, I felt like I was getting a comic project pitched to me. That might have been great but the presentation on many of these seemed sloppy and rushed and did not do the material justice. There are a few gems in here, don't get me wrong, but overall the work is lacking. In addition to the problems with presentation, I also was unsure of the role the book would play on my bookshelf. There is beautiful art and stories, but each chapter ends with a demo on how the artist made a certain piece within the book. Why? All of a sudden my display/coffee table book has decided to become an instructional book. I"m interested in that kind of thing but it felt so shoehorned in in this case. It's almost as if the people who made it were not confident enough in the art and stories to let them stand on their own. I want to assert also that these parts of the books are demos, they were way to brief to share the creative process of the artist behind them. I'm not saying no one will like this book, but I want to get it across that this book has much more of an unfinished comic book feel to it than one full of concept sketches. If that is not what you're expecting, then don't buy it. My book arrived damaged, so I was going to return it regardless, but I did not opt for an exchange in the end.